Inside our minds the message got in – that the big, red, chunky bar of soap could keep us healthy…….. read somewhere that the first container of Lifebuoy soaps landed in Bombay harbour way back in 1895 …….. some other source state that it commands a market share close to 15% ~ a catchy brand name linked to rescue at sea that ‘lifebuoy’ would save lives….. was it too masculine targeting a particular segment alone ? ~ later it showed boys playing hockey and hard sports, then taking bath with this hard soap…. Lifebuoy was marketed originally by Lever Brothers in England in 1895. It is no longer produced in UK & US ~ but is available in many other countries including India. Now it is the product of Hindustan Unilever Limited (HUL) in India. HUL is leading FMGC with reach in every city and village. With over 35 brands spanning 20 distinct categories such as soaps, detergents, shampoos, skin care, toothpastes, deodorants, cosmetics, tea, coffee, packaged foods, ice cream, and water purifiers, the Company is a part of the everyday life of millions of consumers across India. Its portfolio includes leading household brands such as Lux, Lifebuoy, Surf Excel, Rin, Wheel, Fair & Lovely, Pond’s, Vaseline, Lakmé, Dove, Clinic Plus, Sunsilk, Pepsodent, Closeup, Axe, Brooke Bond, Bru, Knorr, Kissan, Kwality Wall’s and Pureit. It is big with a reported turnover of around Rs.25,206 crores (financial year 2012 - 2013). HUL is a subsidiary of Unilever. 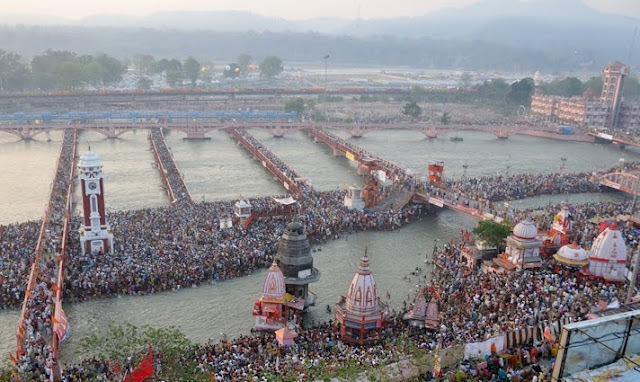 The Nation witnessed the largest ever religious congregation – the Kumbh Mela ~ at Allahabad devotees took holy bath at the confluence (Sangam) of the Ganges; the Yamuna and the mythical Saraswati. Kumbha means a pitcher and Mela means fair in Sanskrit. By some estimates more than 80 million people attended Kumbh Mela in Feb 2013. The Mela happens every 12 years. After visiting the Kumbh Mela in 1895 Mark Twain wrote: "It is wonderful, the power of a faith like that, that can make multitudes upon multitudes of the old and weak and the young and frail enter without hesitation or complaint upon such incredible journeys and endure the resultant miseries without repining. It is done in love, or it is done in fear; I do not know which it is. No matter what the impulse is, the act born of it is beyond imagination, marvellous to our kind of people, the cold whites." At Harvard University in Cambridge, Massachusetts, a study on the Kumbh Mela pilgrimage was held in a symposium titled 'South Asia without Borders 2013'. It is natural that every brand vies to create an impression and exhibit their wares where there is such a massive gathering……….. the mega Hindustan Lever had a novel way of advertising its lifebuoy product…….. advertising on 'rotis' at the Kumbh Mela - ' Lifebuoy se haath dhoye kya?'. 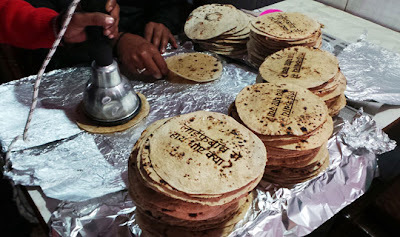 Going by a report in ET – HUL partnered more than 100 dhabas and hotels at the mela site to serve rotis that were stamped with "Lifebuoy se haath dhoye kya?" (Have you washed your hand with Lifebuoy?) "The 'Roti Reminder' gets a consumer's attention at the exact time when hand washing is critical," – according to the advt managers. 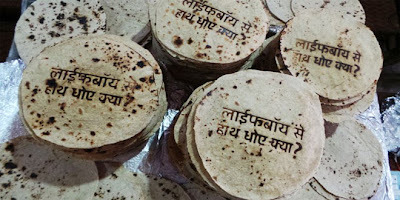 It was a well thought-out strategy – the company made special heat stamps to make that impression of its message on rotis and hired 100 promoters to stand in 100 kitchens across the mela. The campaign reportedly ran for a month stamping being done on million of rotis. Thus it was lifebuoy’s brand promotion of handwashing trying to prevent the spread of infections, through the ‘Roti Reminder’ . The brand in their website states that its social mission is to bring safety, security and health to people through the active promotion of handwashing with soap. It claims that by 2015, Lifebuoy aims to change the hygiene behaviour of 1 billion consumers across Asia,Africa and Latin America by promoting the benefits of handwashing with soap at key times. In 2002, Lifebuoy started a campaign known as Lifebuoy Swasthya Chetna, to promote good health practices by actively encouraging people to inculcate good hygiene practices, such as washing hands with soap at least five times a day. It is claimed that these initiatives will help reduce the incidence of life-threatening diseases like diarrhoea.